00:10:00 Makes 12 servings, 2 Tbsp. (30 mL) each. Makes 12 servings, 2 Tbsp. (30 mL) each. MIRACLE WHIP Dressing adds tangy zip to this quick-and-easy dip. Mash avocados with fork in medium bowl. Stir in next 3 ingredients. 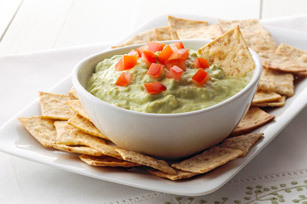 Serve with Christie Wheat Thins Crackers, tortilla chips or cut-up fresh vegetable dippers. Serving Size Makes 12 servings, 2 Tbsp. (30 mL) each.